That’s the way the role is intended to work: it’s aimed at agents who need to be look at user records, but who don’t need (and thus shouldn’t have) the ability to create, modify, or delete user records. And what’s wrong with that? Nothing. Again, that’s exactly what the role is intended for. That said, however, you might have agents who need the ability to look at user records and to look at global/property settings. So which Console role provides read-only access to that set of items? Well, to be honest, none of them. But that’s OK. 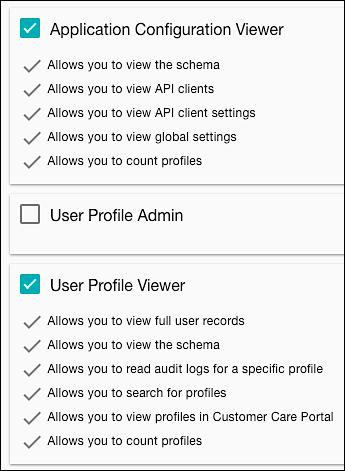 If you have agents who need to combine the User Profile Viewer role and the Application Configuration Viewer role, then just assign those agents both roles. On the Edit Agent page, and if necessary, clear any roles currently assigned to the user (unless, of course, that role is one of the roles you want assigned to the user). Why do you have to do this? Well, suppose the user is currently a Customer Care Portal Editor, and, without clearing that role, you assign him or her two new roles. Because you did not clear the old role, the user will now have three assigned roles: Customer Care Portal Editor, User Profile Viewer, and Application Configuration Viewer.